We are here introducing the clients with our range of totally automatic Gold Mining Equipment suitable for various mines as the machine crush the mining scrap and recovered gold up to 92% pure. The body is made of strong steel and the Cathodes are made up of polished stainless steel sheet. Our wide range of products offered by us include Mining Equipment, Mining Machinery, Golf Refining and Gold Refinery that are procured from Mumbai. Sladjana Enterprises offers you the highest caliber of surface mining equipment, providing a comprehensive array of Mining Equipment with high technical strength for crusher and air swept mill to mine gold and other precious metal. The gold is refined by Gold refining machine is used to refine gold to give a purity of 99.99%. Our machine is offered with 3 round bottom flasks, which can resist strong acid and heat. 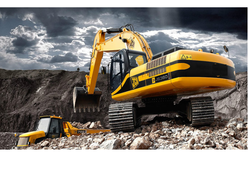 Looking for Gold Mining Equipment ?